Lively and refreshing: Rachel Elderkin reviews the New English Ballet Theatre performing The Four Seasons and Other Modern Ballets. New English Ballet Theatre at Sadler’s Wells. Since the company was founded in 2011, New English Ballet Theatre have been committed to nurturing young dancers and the work of emerging choreographers, with a particular focus on the work of female artists. In their latest programme, a triple bill of modern ballets, it is the two works by female choreographers that lead the way with Jenna Lee’s new ballet The Four Seasons making a bright and promising debut. The opening work, Enticement’s Lure by male choreographer Valentino Zucchetti, leans towards a more contemporary tone. However, it’s a style at odds with a choreographic thinking that remains, for a modern dance work, too much in the classical past. The main problem lies in the unoriginality of its idea. A man is side-tracked by a passionate woman in red, destroying his loving relationship with another female dancer – costumed in a pure, delicate beige. While she grieves, a second male suitor attempts to win her affections. Throughout, the shadowy presence of dancer Matthieu Quincy appears to manipulate their desires and it all ends in tears around his feet. It’s a story we have seen many times before and, with its traditional partnerships and imagery, there is little to expose this tale in a new light. The fluent, classically influenced movement particularly suits the two women and they show themselves as expressive, controlled dancers, despite the limitations of the choreography. Given the dark and dramatic possibilities presented by Rachmaninov’s score you long for this opening work to push contemporary ballet into a more exciting and challenging place – especially with such a youthful and relatively new company as NEBT. Despite a questionable start, the remainder of the programme presents modern ballet in a more positive light and offers a more enticing challenge for the company’s talented dancers. Daniela Cardim’s Vertex takes an abstract approach and its clean, minimal design – across set, costume and choreography – results in a fresh, enjoyable work. Set to Camargo Guarnieri’s String Quartet No.2, Cardim’s choreography is delicately attuned to the changing tones of its score. From light and lively to soft elegance the dance flows with the music, its modern, lyrical quality perfectly suited to its young dancers. The gently shifting hues of Andrew Ellis’ lighting design provide the perfect complement. It is with one of the most well-known works of classical music that NEBT close their programme. With its varied musical movements, Vivaldi’s The Four Seasons presents both a challenge and a wealth of possibilities, and choreographer Jenna Lee embraces this – as does costume designer April Dalton. Bold and stylish, The Four Seasons is a work driven by its music (a re-composition by Max Richter) and in that lies its strength. The choreography is full and varied, shifting from full-cast, to pas-de-deux to carefully designed group work. Lee exhibits a flair for structuring group sections, with some intricate patterning and shifting partnerships. There are times where the entrances and exits of dancers require a more subtle blending and moments where the pause between musical movements is too long, creating a segmented feel at odds with the fullness of the choreography. However, this is neoclassical dance presented in a lively and refreshing manner and, with some minor refinements, The Four Seasons could prove a vibrant and leading work for the company. Lee’s choreography is skilfully offset by Dalton’s exquisite costume designs. From flared floral print dresses in the pink and lilac hues of summer, to the bronze tones of Autumn, and the jagged, sparkling bodices of winter, Dalton’s designs enliven the stage. 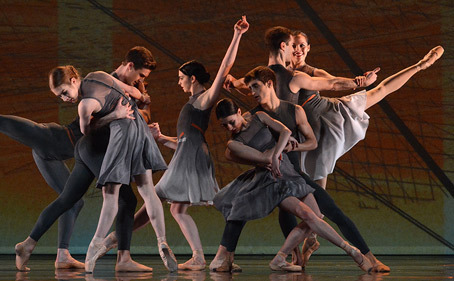 Combined with spirited and uplifting dancing from the company it’s a fitting close. The Four Seasons and Vertex offer an exciting glimpse of the capabilities of this modern ballet company – there’s still artistry to deepen and potential to fulfil but, with the right choices, NEBT could be a company to watch. NEBT were performing at Sadler’s Wells. Click here for more details.